Working in the cloud has become the norm for many developers. You’ve got plenty of cloud IDEs to work with and most of them have features rivaling desktop editors. But few programs have any sort of collaborative mode where you can edit code with others. Collab on Code makes this a reality with their free browser-based code editor. All you have to do is enter a workspace name and this app handles the rest. Once your main workspace is created you can share it with anyone. The URL remains the same and it’s a public editor so there’s no password protection. This means you can get a group coding project going with multiple people from anywhere in the world! People can overwrite work you’ve done. Hard to write code at the same time in the same document. Still this project is a feat of modern technology proving that almost anything is possible with the right web tools. And there’s truth in the idea that collaboration helps developers. It’s so much easier to work with a team and share ideas rather than going solo. I’ve found this app most useful for sharing snippets or little project ideas, also maybe for helping to solve bug fixes. It’s different than a cloud IDE like CodePen because when you create something on CodePen someone else can edit and fork your pen, but they cannot save changes directly. With Collab on Code, you can grant anyone direct access to the HTML/CSS IDE for whatever you’re tinkering with. All from the comfort of a browser window. To get started just visit the homepage and enter a name for your workspace. Keep it brief and clean—from what I can tell there’s no way to delete these! If you have ideas for improving the site you can also message the creator directly @awoldes. 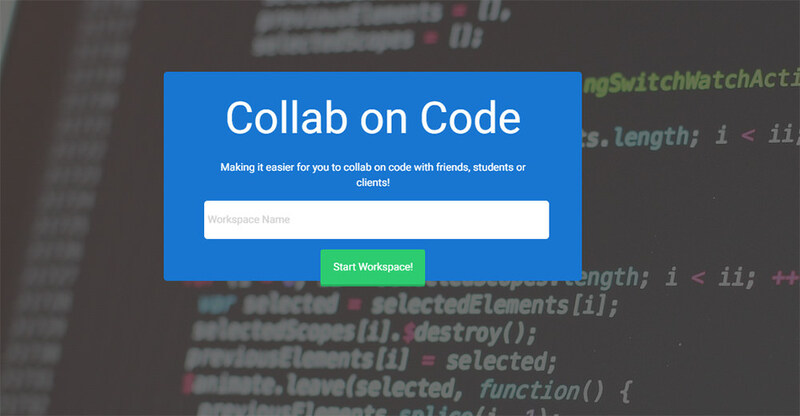 The post Collab on Code – A Free Cloud IDE for Coding with Multiple People appeared first on Hongkiat.